Asteroid fields are a collection of asteroid clusters of different sizes. Asteroid Fields can be found in deep space. A ships sensor package will warn pilots of nearby asteroid fields. You can click on the asteroid warning to highlight nearby asteroids. 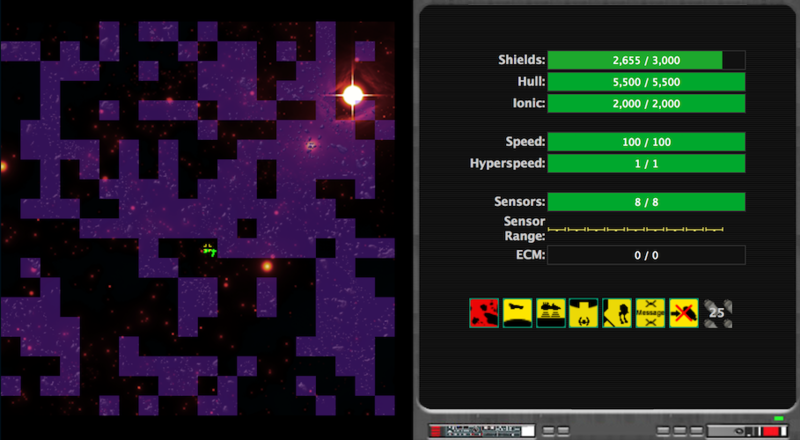 Squares marked with a blue shroud or with "Asteroid Field" tooltip are considered asteroid fields. Asteroids occlude regular sensors, and flying within asteroid fields can be a blinding experience. Asteroid fields are dangerous places. Asteroids behave unpredictably, and travelling through them is very dangerous. Damage is applied to shields, then to hull, although some damage may hit critical systems, and some damage may pierce shields. Ships located on the edge of the grid do not take damage from asteroids e.g. (X, 0), (X, 19) (0, Y), (19, Y). Constant collisions make regular shielding ineffective, and regular stations cannot be built within asteroid fields. Asteroid fields are home to scum and villainy. Bandits in small squads of fighters, gunships and corvettes may spawn and hunt down unwary players. Between 2 and 4 squads of bandits will spawn in an asteroid field. Bandits usually fly weaker ships such as ugly class fighters. Bandits will only attack player controlled ships. Bandits will only attack if the player has attacked a bandit squad within the past 48 hours. Bandits will still counter attack normally per space combat rules. Destroyed bandit ships will be wrecked and converted to NPC-owned, and can be recycled using the appropriate tools. Bandits will not spawn if there are any stations present within the asteroid field deep space square. New bandit squads spawn when the asteroid field has no players present. Bandits will despawn if no players are present in the asteroid field for 7 days. Wrecks of bandit ships will not despawn.